Definitely a great reading week for me......another masterpiece this one is. My God! I still can't believe that book is that amazing. 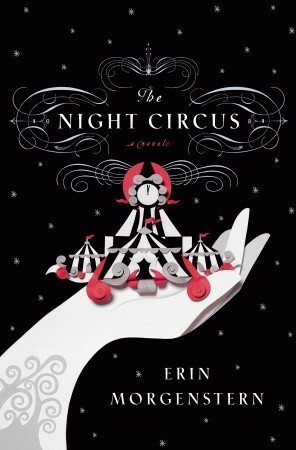 Presenting The Night Circus by Erin Morgenstern. Circus..there was a time when people used to anticipate the coming of a circus every year. Of the amazing animals there, the acrobats doing wondrous flips on ropes and jumps to the ohhs and ahhss of a rapt audience and the magician pulling out rabbits from their hats or getting a volunteer to apply their tricks on. That was the time when such simple acts would arouse such joy in the people but in this technological age the novelty of circus is somehow lost on us. But Erin Morgenstern has done what many had failed to do so. She has painted a picture of the circus like no other. How well do you see the instruments, all the brain storming, all the planning that goes into the creation and proceedings of a circus. How well do you see the machination involved in the illusionist's act....we only see what is infront of us. Thus, this is where the book gets interesting. Ms. Morgenstern paints a picture like no other. Le Cirque des Rêves, the circus of dreams, the night circus, for it opens just when the sun sets and closes when when dawn lights the skies. A circus like no other, formed of great-a-many tents instead of a single large tent and colored only in strips of black and white. Almost dreamlike and mystical. The author takes us on a tour that is sure edge its mark upon our memories. Acrobats, trained animals, illusionist, trainers.....you won't see a circus like no other. But at heart it is the battleground for two magicians Celia and Marco. Both bound by their masters, Prospero & Mr. A.H. duel to best the other. Both being trained in ways different than the other. As the duel proceeds....the poor souls know nothing of what is asked of them. Rules were never specified. What is expected of them is never specified. They have no inclination of how the winner shall be selected. So, they go about erecting tents trying to impress the other. But then they meet each other and what began as a duel takes the shape of a love story, every tent they erect, a form of love letter to the other recipient. When worst comes to worst they realize what is actually asked of them, they take drastic steps in order to remain together. Shelved as an 'adult fiction' it can be actually be a cross between an adult and a young adult fiction. Told in a circular fashion accentuating the concept of the circle of life and of the circus, one time it tells the story in the present, the next we get the flashbacks, another perspective shows us the outsiders looking in and another from the author's own giving us a tour of sorts. And this may be Celia and Marco's tale, where a bunch of other characters get entangled in the mess but at large the true hero of this story in the circus. Because it is the circus that is the battleground, it is the circus that sets the stage and it is the circus that connects them all. "Mystical and dreamlike, Erin Morgentern paints a true picture of the circus never before seen with her cunning penmanship and a seductive prose"
Holy crap, great review! I've seen many billboards advertising this book but I still didn't understand exactly WHAT this book was about. Great review! I could really grasp the book's plot and the nature of the characters. Sounds like a great read! I know! I loved the complexity that the author put into a simple circus and made it so awesome!